This is the true story of the Midnight ride of Paul Revere in his own words. This personal account was given by Paul Revere in a deposition to the Provincial Congress of Massachusetts in their effort to determine who fired the first shots at the Battle of Lexington. This account of the Midnight ride of Paul Revere is one of three personal accounts of his ride that have survived. There is a more thorough account of Paul Revere's ride which he wrote to Jeremy Belknap, president of the Massachusetts Historical Society, in 1798. 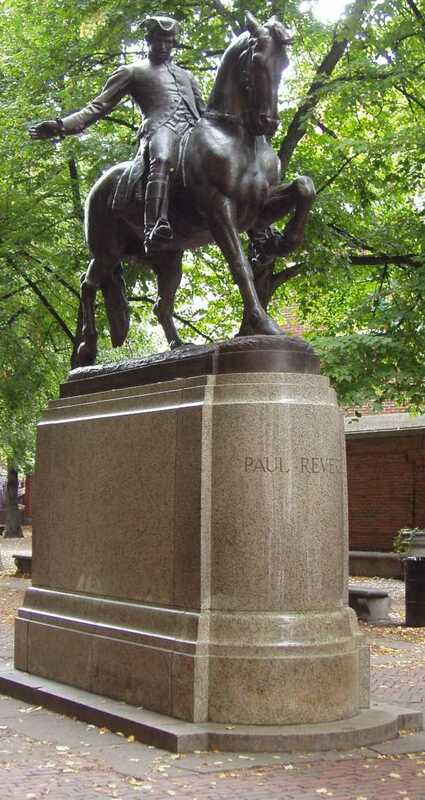 You can read that account of the Midnight ride of Paul Revere here. I proceeded immediately, and was put across Charles River and landed near Charlestown Battery; went in town, and there got a horse. While in Charlestown, I was informed by Richard Devens Esq. that he met that evening, after sunset, nine officers of the ministerial army, mounted on good horses, and armed, going towards Concord. I set off, it was then about 11 o'clock, the moon shone bright. I had got almost over Charlestown Common, towards Cambridge, when I saw two officers on horse-back, standing under the shade of a tree, in a narrow part of the road. I was near enough to see their holsters and cockades. One of them started his horse towards me, the other up the road, as I supposed, to head me, should I escape the first. I turned my horse short about, and rode upon a full gallop for Mistick Road. He followed me about 300 yards, and finding he could not catch me, returned. I proceeded to Lexington, through Mistick, and alarmed Mr. Adams and Col. Hancock. After I had been there about half an hour Mr. Daws arrived, who came from Boston, over the Neck. We set off for Concord, and were overtaken by a young gentleman named Prescot, who belonged to Concord, and was going home. When we had got about half way from Lexington to Concord, the other two stopped at a house to awake the men, I kept along. When I had got about 200 yards ahead of them, I saw two officers as before. I called to my company to come up, saying here was two of them, (for I had told them what Mr. Devens told me, and of my being stopped). In an instant I saw four of them, who rode up to me with their pistols in their bands, said ''G---d d---n you, stop. If you go an inch further, you are a dead man.'' Immediately Mr. Prescot came up. We attempted to get through them, but they kept before us, and swore if we did not turn in to that pasture, they would blow our brains out, (they had placed themselves opposite to a pair of bars, and had taken the bars down). They forced us in. When we had got in, Mr. Prescot said ''Put on!'' He took to the left, I to the right towards a wood at the bottom of the pasture, intending, when I gained that, to jump my horse and run afoot. Just as I reached it, out started six officers, seized my bridle, put their pistols to my breast, ordered me to dismount, which I did. One of them, who appeared to have the command there, and much of a gentleman, asked me where I came from; I told him. He asked what time I left. I told him, he seemed surprised, said ''Sir, may I crave your name?'' I answered ''My name is Revere. ''What'' said he, ''Paul Revere''? I answered ''Yes.'' The others abused much; but he told me not to be afraid, no one should hurt me. I told him they would miss their aim. He said they should not, they were only waiting for some deserters they expected down the road. I told him I knew better, I knew what they were after; that I had alarmed the country all the way up, that their boats were caught aground, and I should have 500 men there soon. One of them said they had 1500 coming; he seemed surprised and rode off into the road, and informed them who took me, they came down immediately on a full gallop. One of them (whom I since learned was Major Mitchel of the 5th Reg.) clapped his pistol to my head, and said he was going to ask me some questions, and if I did not tell the truth, he would blow my brains out. I told him I esteemed myself a man of truth, that he had stopped me on the highway, and made me a prisoner, I knew not by what right; I would tell him the truth; I was not afraid. He then asked me the same questions that the other did, and many more, but was more particular; I gave him much the same answers. He then ordered me to mount my horse, they first searched me for pistols. When I was mounted, the Major took the reins out of my hand, and said ''By G---d Sir, you are not to ride with reins I assure you''; and gave them to an officer on my right, to lead me. He then ordered 4 men out of the bushes, and to mount their horses; they were country men which they had stopped who were going home; then ordered us to march. He said to me, ''We are now going towards your friends, and if you attempt to run, or we are insulted, we will blow your brains out.'' When we had got into the road they formed a circle, and ordered the prisoners in the center, and to lead me in the front. We rode towards Lexington at a quick pace; they very often insulted me calling me rebel, etc., etc. After we had got about a mile, I was given to the sergeant to lead, he was ordered to take out his pistol, (he rode with a hanger,) and if I ran, to execute the major's sentence. When we got within about half a mile of the Meeting House we heard a gun fired. The Major asked me what it was for, I told him to alarm the country; he ordered the four prisoners to dismount, they did, then one of the officers dismounted and cut the bridles and saddles off the horses, and drove them away, and told the men they might go about their business. I asked the Major to dismiss me, he said he would carry me, let the consequence be what it will. He then ordered us to march. When we got within sight of the Meeting House, we heard a volley of guns fired, as I supposed at the tavern, as an alarm; the Major ordered us to halt, he asked me how far it was to Cambridge, and many more questions, which I answered. He then asked the sergeant, if his horse was tired, he said yes; he ordered him to take my horse. I dismounted, and the sergeant mounted my horse; they cut the bridle and saddle of the sergeant's horse, and rode off down the road. I then went to the house were I left Messrs. Adams and Hancock, and told them what had happened; their friends advised them to go out of the way; I went with them, about two miles across road. After resting myself, I set off with another man to go back to the tavern, to inquire the news; when we got there, we were told the troops were within two miles. We went into the tavern to get a trunk of papers belonging to Col. Hancock. Before we left the house, I saw the ministerial troops from the chamber window. We made haste, and had to pass through our militia, who were on a green behind the Meeting House, to the number as I supposed, about 50 or 60, I went through them; as I passed I heard the commanding officer speak to his men to this purpose; ''Let the troops pass by, and don't molest them, without they begin first.'' I had to go across road; but had not got half gunshot off, when the ministerial troops appeared in sight, behind the Meeting House. They made a short halt, when one gun was fired. I heard the report, turned my head, and saw the smoke in front of the troops. They immediately gave a great shout, ran a few paces, and then the whole fired. I could first distinguish irregular firing, which I supposed was the advance guard, and then platoons; at this time I could not see our militia, for they were covered from me by a house at the bottom of the street.